The traditional architecture of Muharraq, once the capital of Bahrain and pearling capital of the Gulf, contrasts with the skyscrapers of Manama, the island-nation’s capital today, just a couple of kilometers to the west. It’s 9:30 on a Saturday morning, and already the usual crowd is building up outside Saffron, a café on Muharraq, the second-largest island in the archipelago of Bahrain. Locals and foreigners chat congenially while they wait for tables to open. Parents distract restless children by pointing out to them the 400-year-old date press sunk into the ground that extends under the café, visible through glass panels in the floor. It’s a typical weekend rush at Saffron, one of the most successful of the restored and repurposed historic buildings on the island that was once the capital of Bahrain during its centuries of pearling prowess. It’s also a fine place to take on sustenance before setting out on the 3½-kilometer “Pearling Path” to view 17 restored historic buildings that celebrate Muharraq’s heritage—part of a string of local sites that in 2012 unesco placed on its World Heritage List. Visitors sample traditional Bahraini fare in Saffron, a popular eatery in old Muharraq along the island’s 3½-kilometer urban trail called the Pearling Path. “There is great interest in the food that our ancestors would have eaten,” explains Saffron owner and chef Narise Kamber. “Many Bahrainis have studied and worked abroad and are used to international food. Here they get something local, traditional, but with a contemporary twist.” The mix of old and new is carried throughout the café’s concept from its exterior, which blends with the narrow lanes of the nearby marketplace to its menu, music, and décor that fuses industrial chic with heritage. Among the offerings are sweet vermicelli cooked in rosewater, cardamom and saffron; beans slow-cooked in a spicy tomato sauce; thin bread brushed with an anchovy-like fish paste; a vegetarian kebab; and a subtly spiced potato dish served with milk tea. All are enhanced by music playlists Kamber has compiled from childhood memories of hearing folk songs hauntingly sung by local artists. “Youngsters often ask me if they can download,” she says with a laugh. “We enjoy eating here because of the atmosphere,” says a young regular named Abdulla, who is tucking into a “full Bahraini” breakfast. “And the food tastes great!" The heavy, 100-year-old wooden door at Saffron’s entrance is another relic of the past, and it is a portal to the future for Muharraq—a link between the island’s rich history and its newfound modern identity as a culture hub. In the early 1930s, Bahrain had to recalibrate its economy to account for both the discovery of oil and the arrival, from Japan, of the cultured pearl. Together these collapsed the old pearling culture, which had developed over millennia and provided prosperity, social cohesion and identity. 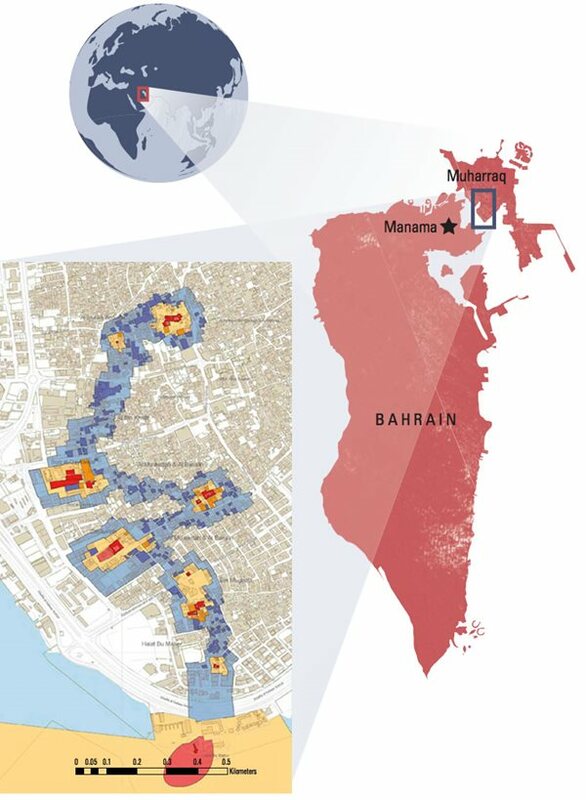 Bahrainis—from ship captains to pearl divers, chandlers to knife sharpeners—had to leave pearling behind as Bahrain’s capital moved a couple kilometers west to Manama. The Pearling Path map classifies both onshore and offshore sites. The path winds north from the shore through the oldest part of Muharraq, which lies northeast of Bahrain’s main island. Muharraq’s residents also gradually abandoned most of the large pearling houses that had been centers of society. Over the years, these structures of timber, faroush (a stone harvested from the sea) and plaster fell into disrepair. In 2002, however, this began to turn around. 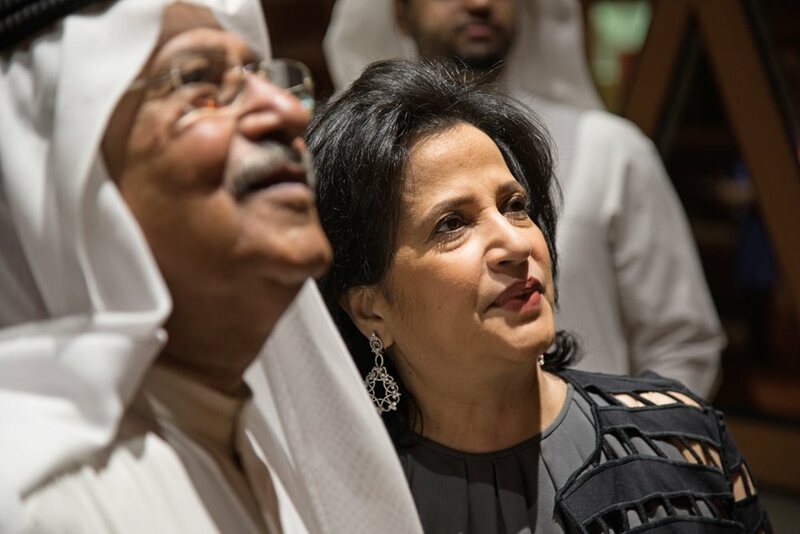 Shaikha Mai bint Mohammed Al-Khalifa, a pioneer in the region’s conservation movement and now president of the Bahrain Authority for Culture and Antiquities (baca), inaugurated the old capital’s first major restoration, the Shaikh Ebrahim bin Mohammed Al-Khalifa Center for Culture and Research. It quickly became a venue for poets, writers and philosophers—and a catalyst for a new Muharraq. Shaikha Mai’s effort was, she says, born out of her respect for Shaikh Ebrahim, her grandfather, and her determination to keep his memory alive. Born in the mid-19th century, he was recognized in the region as a man with a thirst for knowledge and debate who attracted the best minds to his majlis, or salon, until his death in 1933. Among his guests were Farida Mohammed Saleh Khunji, one of Bahrain’s most prominent religious and literary intellects; Yusuf bin Ahmed Kanoo, a leading businessman in the Gulf region; Hafez Wahbah, an educator and author who moved to Riyadh and served as Saudi Arabia’s ambassador to Great Britain during World War ii; and Louis P. Dame, md, a physician at the American Mission Hospital in Bahrain who was known for his work in the region. The center, Shaikha Mai explains, was never planned in isolation. Her vision was to build on—not over—Muharraq’s pearling past. The glass-walled visitor’s center near Bu Maher Fort at the southern tip of Muharraq overlooks the historic launching point for Bahrain’s annual summer pearling fleet and marks the southern starting point for the Pearling Path. Shaikha Mai bint Mohammed Al-Khalifa, president of the Bahrain Authority for Culture and Antiquities and the driving force behind the establishment of the Pearling Path, stands alongside Bahraini journalist and poet Hassan Kamal at the inauguration of Al-Khalifiyah Library in the old city center of Muharraq in April. In the case of Shaikh Ebrahim’s house, architects, engineers, planners and designers, all mainly from the Arab world, turned the house—for the second time around—into a new kind of magnet for intelligentsia, one featuring a 300-seat auditorium with a research library upstairs. On its walls, photographs portray the hundreds of personalities who have lectured, read poetry, performed music and provided other cultural stimulation since the building’s reopening 15 years ago, including Zahi Hawass, Egypt’s former antiquities minister, and Zeinab Badawi, a British television and radio journalist who was born in the Sudan. This year’s anniversary provided a chance to assess the area’s changes, and the baca celebrated and promoted it with “15/15,” an art exhibition spread among 15 restored houses. Hala Al Khalifa, director of Culture and Arts at the baca and an artist herself, stepped back in time with an installation called “Light” that projected, on the center’s façade, the names in Arabic of leading figures who had visited the house during Sheikh Ebrahim’s time. “I wanted to highlight the legacy of my great-grandfather on the spot where he met many forward-thinking personalities from countries throughout the world,” she explains. 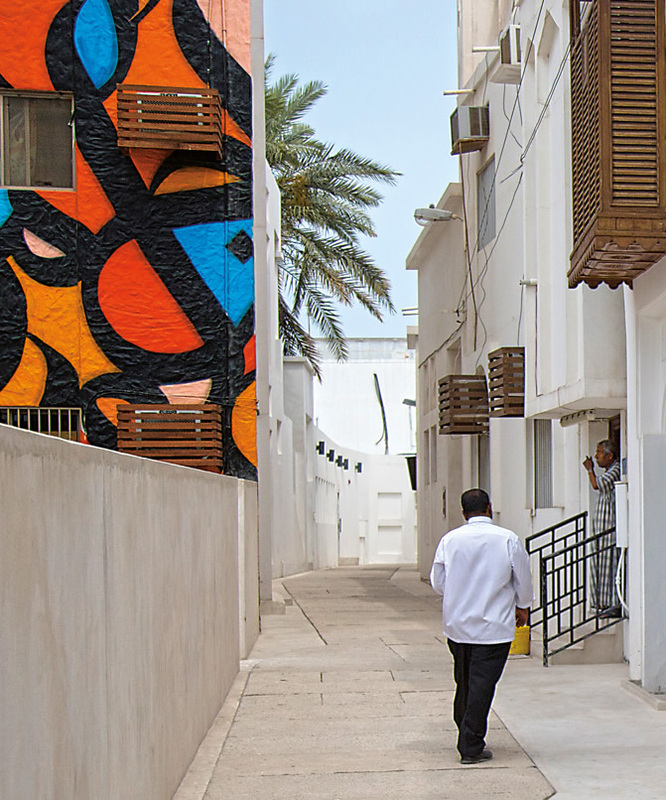 Visitors to the three-month-long celebration could walk along the new, winding, pedestrian-only “Pearling Path,” which zigs, zags and wiggles through the southwest part of Muharraq. Officially it starts northbound from Bu Maher Fort on the island’s southern tip, which was the historic departure point for pearl divers as they left for a four-month season every summer. Opalescent, pearl-round streetlights guide visitors from a simple pearl diver’s house, Bayt al-Ghus (from ghawwas, Arabic for diver)—now a small museum displaying the basic tools of the trade (a nose clip, a knife and a string bag for the oysters)—to the grand houses of the pearl merchants, several now endowed with new purpose. 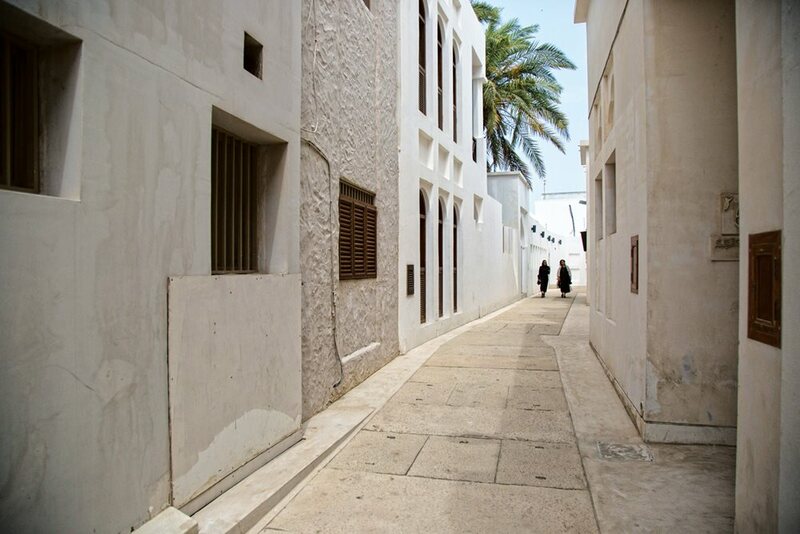 This narrow, shaded, traditional Muharraq thoroughfare, built to channel cooling breezes, is one of the main streets on the Pearling Path. Press House, Al-Nuzul Guest House and Kurar House are all in this vicinity. Shaikha Mai, he says, has been “a force behind all these traditional houses here to ensure they remain standing, and you can see the quality of restoration that has taken place to regain their beauty.” The costs of the restorations have been borne by both public and private sectors through Shaikha Mai’s sponsorship initiative called “Investing in Culture,” which brings Bahrain’s cultural sector into partnership with its banking and financial institutions. As more houses were restored, the Ministry of Culture took the project further, winning unesco approval for the 17 Muharraq buildings, three oyster beds that lie north of the island, part of the shoreline and Bu Maher Fort to all be placed on the World Heritage List. The agency’s report called the places “the last remaining complete example of the cultural tradition of pearling and the wealth it generated ... from the second century to the 1930s,” adding that collectively they represent an “outstanding example” of how human interaction with the environment shaped the economy and society. “We are proud that this final expression of the pearling industry has been recognized internationally,” Shaikha Mai says. The listing has become the springboard for the restoration of the entire old city of Muharraq, which is now one of the best-preserved historic cities in the Gulf region, with another 600-odd buildings to be restored. 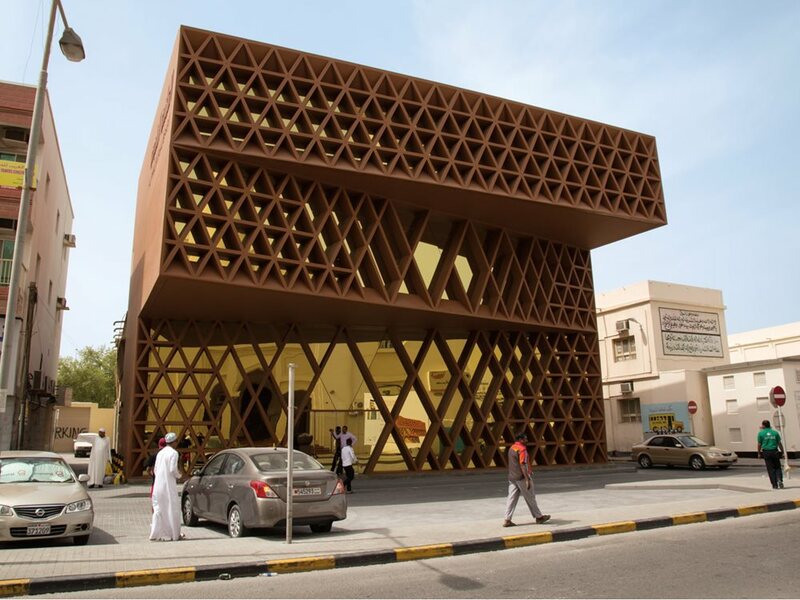 Al-Khalifiyah Library stands on the site of its namesake predecessor, its upper floors cantilevering out to make best use of the limited space. Along with a reading area, a research center and an Internet lab, it offers a cultural program for youth in the heart of Muharraq. 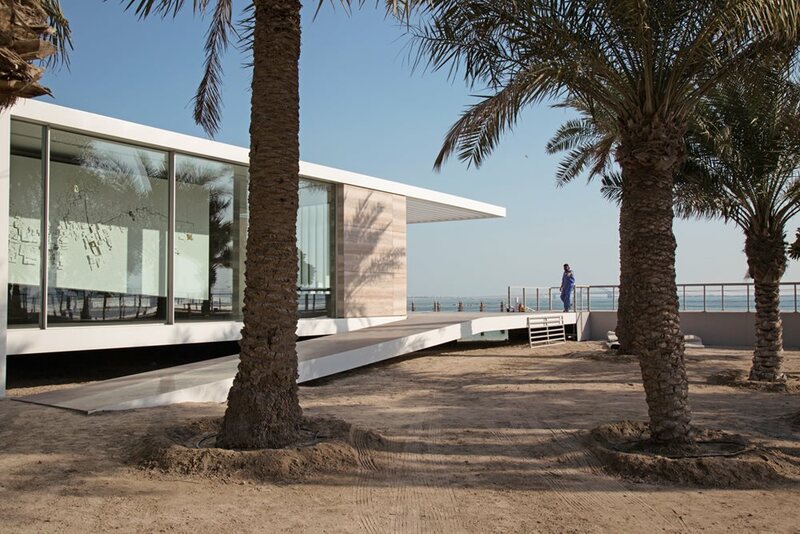 According to Noura Al-Sayegh, a Lebanese architect who works closely with Shaikha Mai on the renovations, the importance of the creation of the Pearling Path goes beyond rebuilding. “We hope to improve the economy by creating cultural tourism as well as making Muharraq a more pleasant place in which to live,” she says. As the group of visitors makes its way along one of the narrow lanes, members enter a small guesthouse that accommodates speakers, poets and singers who appear at the Shaikh Ebrahim Center. In its previous incarnation, the restored house was home for a merchant who traded in ropes and wood used to construct dhows, such as those that carried pearl divers, explains Delobette. At Kurar House, embroiderers deftly entwine gold threads to make one of Muharraq's most famous crafts, the decorative fabric trim after which the house is named. Next stop is Press House, the former dwelling of Abdullah Al Zayed, founder, in 1939, of the first weekly newspaper in Bahrain and the Gulf region. His 100-year-old home has been reborn as a place of both architectural and literary illumination dedicated to preserving Bahrain’s press heritage with displays and an archive of the country’s early journalism. Al Zayed’s typewriter, official letters written on it in English by the multilingual owner, his bed, photographs of the man himself, and back copies of the newspaper that ran until 1944, shortly before his death, all give texture and context to the restoration. From one of its upstairs windows, a contemporary addition to the neighborhood is brightly visible: a wall filled with the colorful calligraffiti of French Tunisian artist eL Seed. It contrasts dramatically with its immediate neighbors, the understated Siyadi House, whose plain exterior belies an intricate interior, and the adjacent Siyadi Mosque, built by Ahmed bin Jasim Siyadi, a 19th-century pearl merchant, about the same time as the house. The mosque, too, has been restored for community use, and its 10-meter minaret will not be overshadowed anytime soon: Zoning laws now limit buildings in the historic area to two stories. 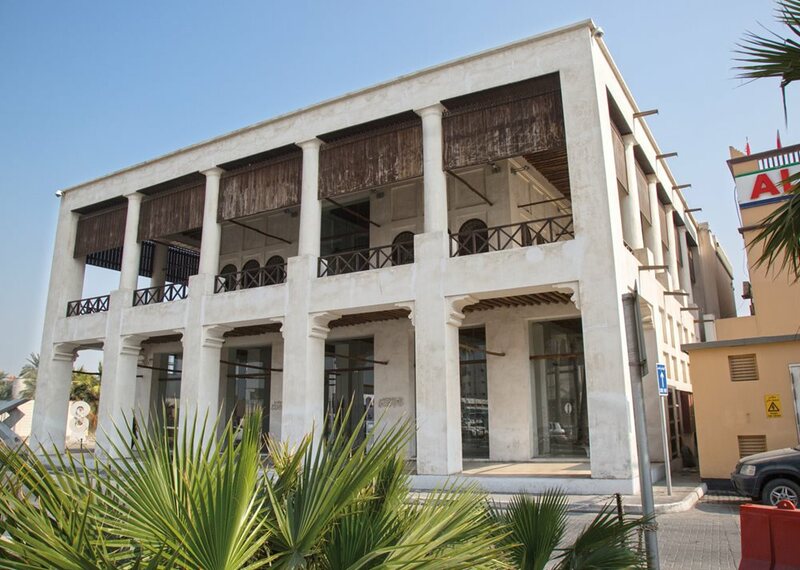 Bin Matar House, built in 1905 by pearling tycoon and philanthropist Salman bin Hussain bin Salman bin Matar, was saved from demolition and restored to house a pearling museum and art gallery. The brilliant colors of a wall mural by eL Seed provides a modern complement to the traditionally whitewashed architecture of Siyadi House, a World Heritage Site that stands nearby. Built in the 19th century, its plain exterior belies an intricately crafted interior. After all the quiet good taste of the earlier restorations, confidence has grown, and some of the most recent restorations and new buildings are near-riots of color and design innovation. Dar Muharraq, for example, has tangerine-colored walls and an outer “curtain” of metal chains that rises whenever dances are performed there and falls again afterward to close off the building. The new Al-Khalifiyah Library is entirely contemporary architecture: With a bronze sheen and gradually cantilevered upper floors, it’s like an inverted ziggurat—a design that takes creative advantage of a small plot of land. One can only imagine the astonishment—and pride—that Muharraq’s divers and merchants might feel now if only they could see their old neighborhood again, a bit like old pearls, once forgotten but rediscovered, buffed and set on a string as a new national treasure. Richard Duebel is a filmmaker, photographer and art director who has been working in North Africa and the Middle East for more than 20 years. His interests lie in culture, the environment and the applied arts. Sylvia Smith makes radio and television programs from the Arab world as well as reports from Europe and elsewhere that explore connections with North Africa and the Middle East.